Hello Games' latest No Man's Sky update, patch 1.65, is out now, with a selection of new content for players to explore. Notably, there's a wide variety of new additions as well as bug fixes, carnivorous bushes, and a new Community Research update. "Specialist Polo has at last emerged from the most involved data analysis they have ever undertaken—followed up by a more physical challenge in their workshop, crafting a new device to move this mystery forwards. They are exhausted and disoriented, but triumphant: they have identified the exact origin of the logs left by their lost Traveller-friends, ultimately a question of “when”, rather than where. Polo requests that participating explorers apply this specialized device to a number of transmission devices on a specific world, characterized by oversized flora. They hypothesize that, with the right time-tuning, and well-considered decisions, it may be possible for explorers to influence events occurring outside of the present moment..."
As an addendum to this mission, you can nab bronze, silver, and gold Atlas statues, with rotating cores. The plants that have been added to the game also include a corn-like crop, a squat dwarf palm, and the aforementioned carnivorous bush. Aside from these new items, the game has undergone several changes, such as fixes to issues where you could get stuck when leaving your ship, updated mission logic, and updated text. 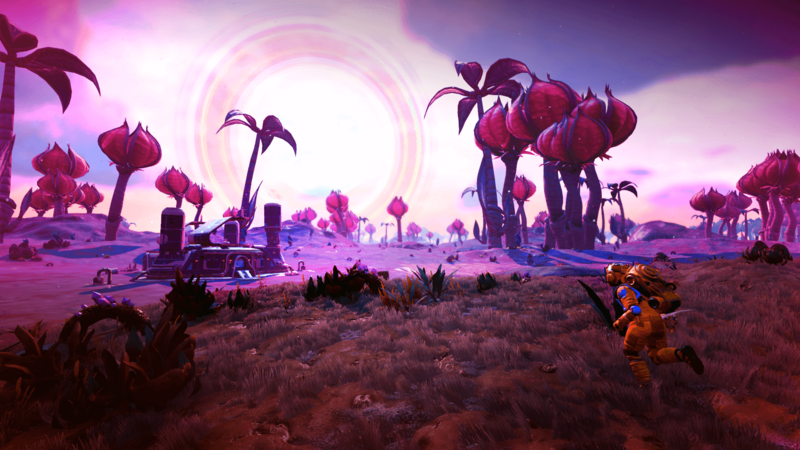 Have something you want Hello Games to tackle next in No Man's Sky? Hit up the Explorer Feedback Survey and let them know!